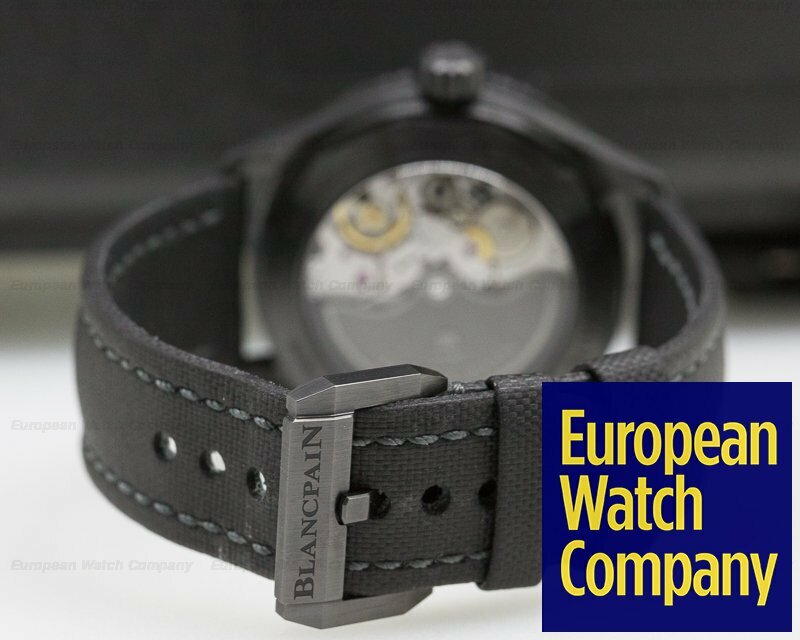 28455 Blancpain 5000-0130-B52A-0001 Fifty Fathoms Bathyscaphe 50000130B52A0001, black ceramic case on a sailcloth strap with a ceramic tang buckle automatic Blancpain caliber 1315, 120 hour power reserve, black sunburst dial, luminous hands and hour markers, date between 4 and 5 o'clock, black polished ceramic fill bezel, centered sweep seconds hand, sapphire crystal, display back, size: 43mm, thickness: 13.4mm, Like new with box and papers; dated 9/2017. 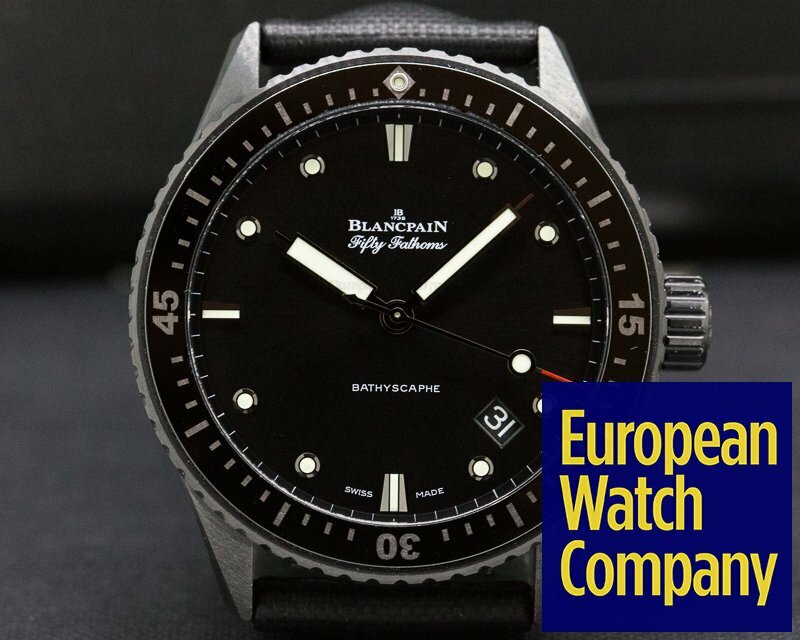 This is a Ceramic Blancpain Fifty Fathoms Bathyscaphe 5000-0130-b52a. It has a canvas strap with matching ceramic tang buckle, and a scratch resistant sapphire crystal. The 43mm diameter solid three-body lightweight case, downturned lugs, and uni-directional bezel are brushed; the graduated diving time indicators are made of scratch resistant Liquidmetal, bonded on black ceramic with a luminous raised dot at the 12 o'clock position. It has a screwed down winding crown, and a sapphire crystal display case back. 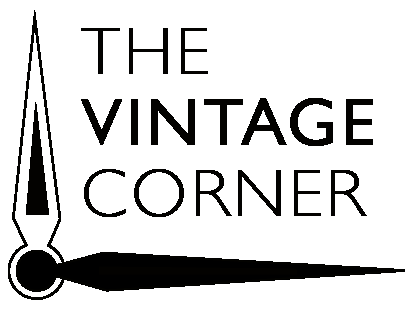 The dial is dark metallic grey with a sunray finish, with luminous baton hands and raised dot and baton hour index markers, and a polished steel central seconds hand with a luminous dot & red tip. There is a date aperture window between 4 and 5 o'clock, and it has a power reserve of 120 hours at full wind. 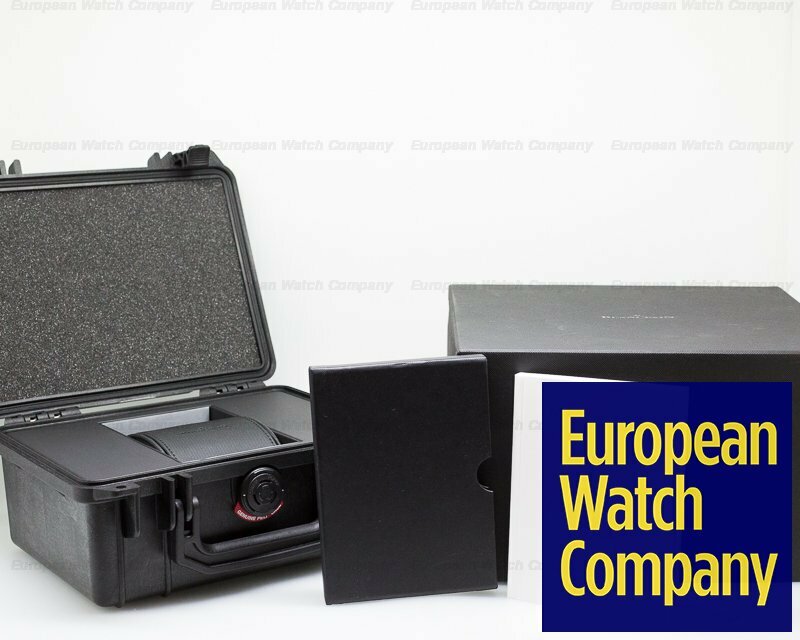 It's water resistant to 300 meters/1000 feet, and the 13.4mm case, dial, and movement are all signed. 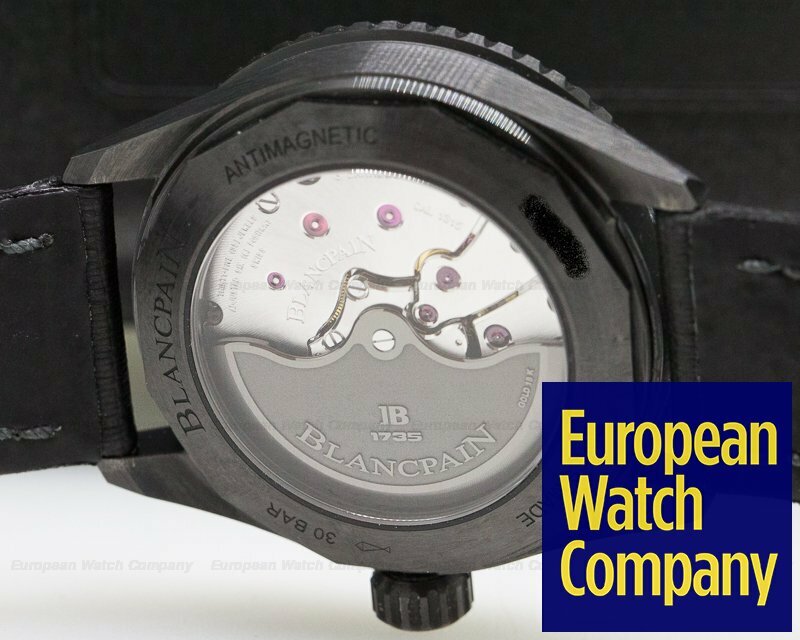 This Blancpain Fifty Fathoms Bathyscaphe 5000-0130-b52a has a mechanical automatic self-winding Blancpain caliber 1315 movement that's rhodium-plated, with fausses cotes embellishment. It's constructed with 35 jewels, 227 components, and a shock absorber mechanism. 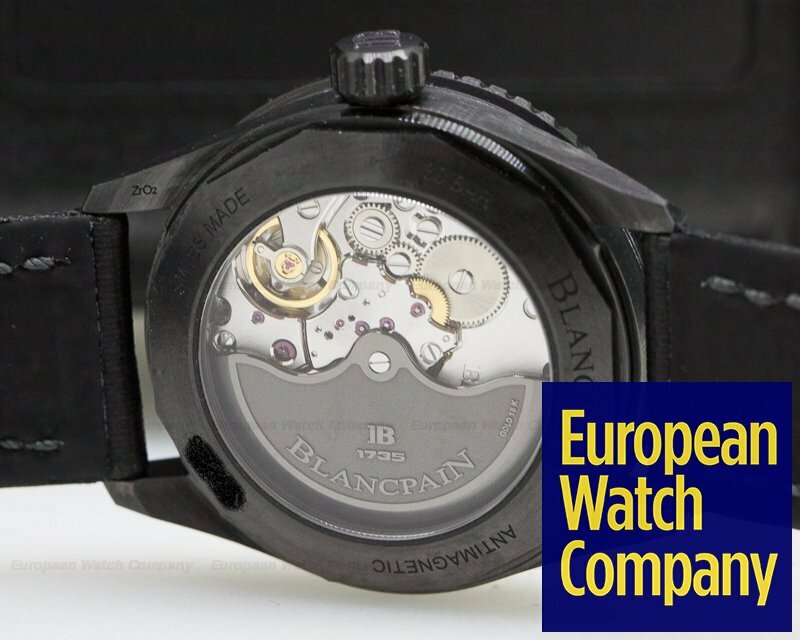 It includes a straight-line lever escapement, a beryllium balance, a self-compensating nonmagnetic flat silicon balance spring, and a hacking seconds mechanism. The movement oscillates at a frequency of 28,800 vph (4 Hz). 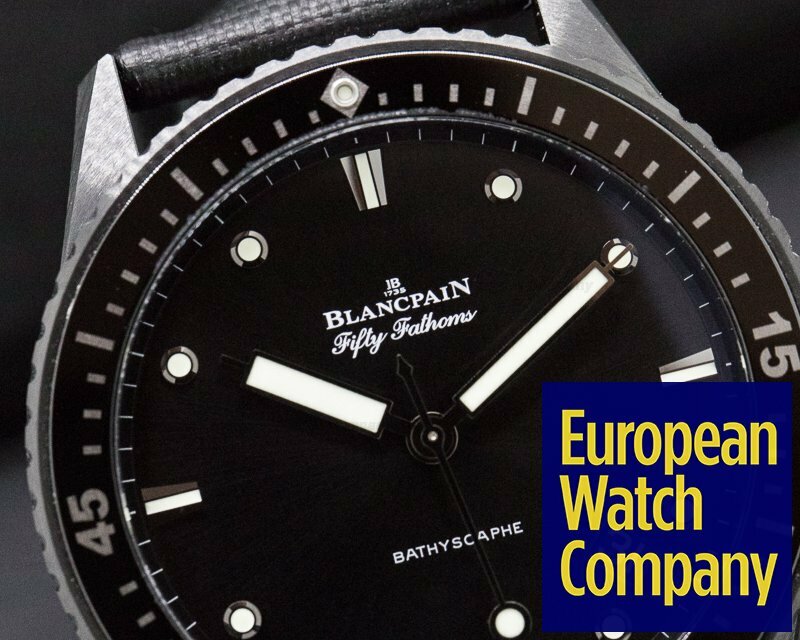 The Blancpain Fifty Fathoms Bathyscaphe 5000-0130-b52a celebrates the 60th Anniversary of the Fifty Fathoms collection, introduced in 1953. This was a project requested by Lieutenant Claude Riffaud and Captain Robert Maloubier, co-founders of the Combat Swimmers, the French version of the US Navy Seals. 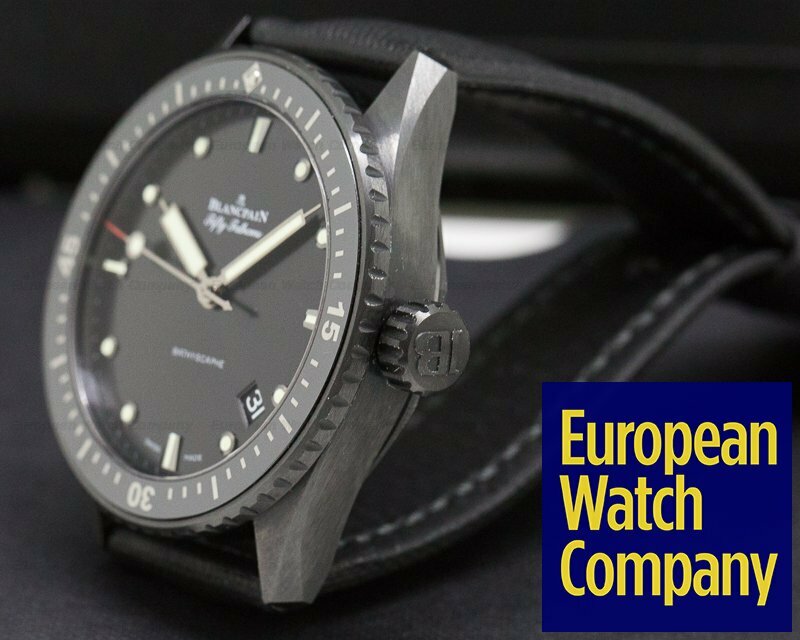 The Fifty Fathoms was soon the industry standard for diving watches with its reputation hugely enhanced by famous undersea explorer Jacques-Yves Cousteau. 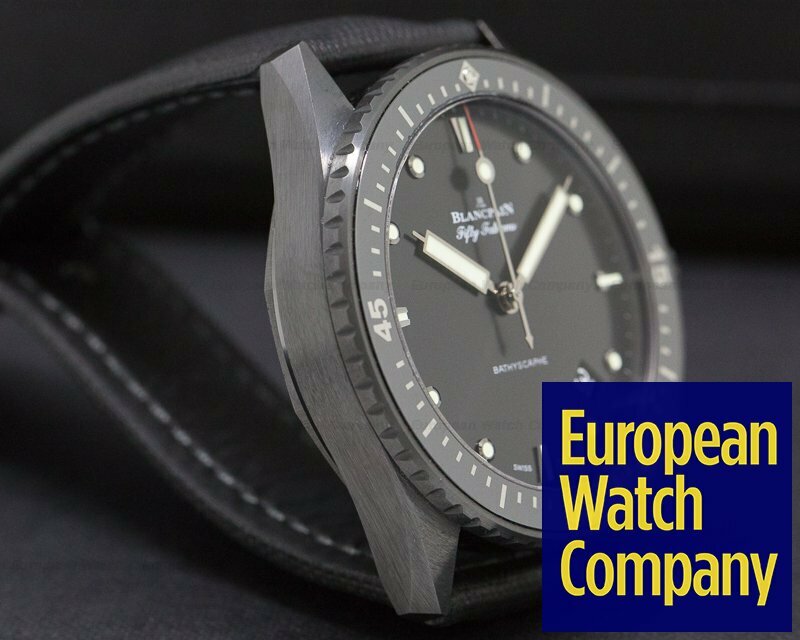 They Bathyscaphe is a re-edition of popular model from the late 1950's.